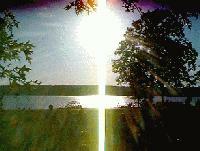 Approximately 150 people convened at Cherokee Landing State Park on Lake Tenkiller in Northeastern Oklahoma for the annual Mary Prayer Day on August 15th (1997). People came from all over the country. One man came from as far as North Pole, Alaska specifically to attend. Others came from New York, New Jersey, North Carolina, Washington, California, Arizona, Iowa, Illinois, Minnesota, and of course Oklahoma and the surrounding states of Kansas, Missouri, Texas, and Arkansas. We started the event with a pot luck supper with everyone contributing. Around 6:45 PM Annie asked for the group to become quiet and she began to meditate. 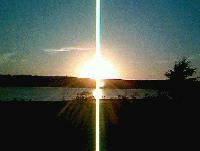 As had been the custom in the past we watched the sun as it began to set over the lake. At about 7:40 PM the sun began to spin and dance and nearly everyone in attendance was able to observe it. At the end of the evening we joined hands and people told how the event had affected them. We then sang Amazing Grace and Let There Be Peace. Sara Korman, attending from Dallas, was so moved by the experience that she wrote the poem below. Then on Saturday, we had an open house at our home near Bunch, Oklahoma. Annie read a message sent by Mother Mary for the group in attendance, requesting that we pray and work for peace. For peace within ourselves to peace for the world. The group decided to pray for world peace every night before retiring. We ask you to join us in praying for world peace every night. That evening we had a bonfire, sang a few songs, then adjourned for the night. Those that wanted to joined us again on Sunday afternoon. We decided to have a "family (meditation) meeting" so those in attendance could experience how our Sunday prayer and meditation meeting are held. Minor miracle: for August 15th Annie asked for and got clear skies and cool weather -- in August!!! "Much spiritual advancement took place ... I never thought that I would be among those who would experience the same things as the souls at Lourdes, Fatima, and many more of the miracles that have happened"
"Thank you so much for including my friends and I in the Mary evening. We've had some remarkable experiences together over the years, but none that touched us as deeply as our experience that evening. We all feel changed -- stronger for the experience ..."
Aug 15-17th will long be the most memorable time of my life! Each time I share the experience, I fill with deep joy and peace! The following poem was written by Sara Korman of Dallas, Texas the night of August 15th, after she had observed the sun spinning at Lake Tenkiller. She has dedicated it to Annie Kirkwood in appreciation of Annie's help in her healing. when we choose to follow!